« Newspaper cutting from Allan Burnett Collection. 2-28th November 2015, Mitchell Library Foyer, Glasgow. 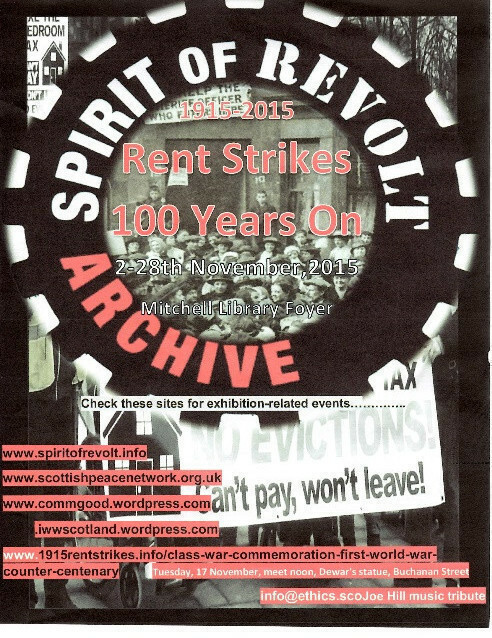 This exhibition organised by Spirit of Revolt ran for the month of November and coincided with the centenary of the death of Joe Hill as well as UK media saturation with WW1 Remembrance shows. 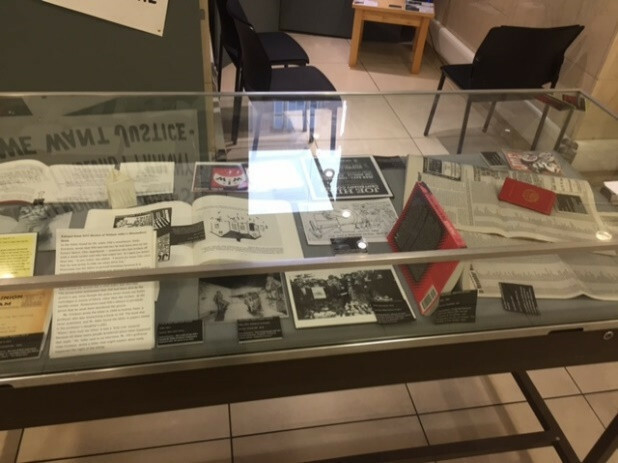 We therefore extended the content of the exhibition to include Anti War agitation including mutiny and pacifism and Joe Hill commemoration material from the SoR archive. 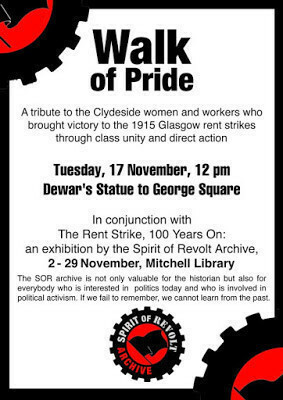 SoR says the history of the struggles of the ordinary people is seldom fully recorded, but we should never let it be lost, to this end the Spirit of Revolt collects, catalogues and publishes on line, as much of the struggles of the ordinary people of Glasgow and Clydeside, as we can get our hands on. It is our history, our culture of struggle for a better life, if we don’t record it, then it will be lost, and we become a people without a history, a people without a culture. Many thanks to those who helped us. 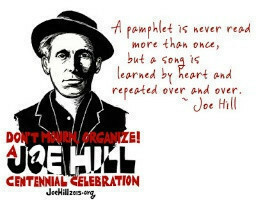 Related events included; a Walk of Pride on 17th November creating a rammy with pots, pans, whistles, racquets and banners followed in December by a Joe Hill song night hosted by Ethics Festival. We provided DVD screenings of Red Skirts on Clydeside, the Kirby Rent Strikes- Behind the Landlords and Sylvia Pankhurst. We ran four children’s workshops re-enacting the techniques and solidarity of the Strikers against the sheriff officers as well as a WW1 Conscientious Objectors Poster Session based on the poem The Workers Pledge in Times of War by Guy Aldred. The Exhibition was fully hosted by SoR members each day answering questions from the public, encouraging debate. 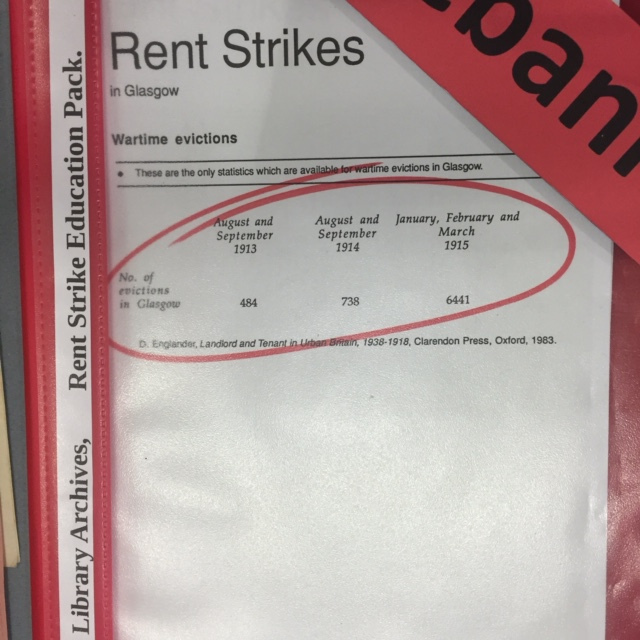 The items on display included Kropotkin’s research calling for the abolition of rent,to international rent strikes and a lesser known Scottish Rent Strike from 1882 on Skye – The Battle of the Braes – which we deconstructed to demonstrate the similar strategies used 35 years later in Glasgow. The Exhibition highlights the use of rent strikes across the world as a tool of struggle by people trying to improve or safeguard their Conditions. The success of the UK rent strikes was interlinked with the power of workers to withdraw their labour from the War-drive industries in solidarity with their communities. The Worker “must be housed somehow or other…but who knows what the new Government will do to-morrow? Who can say that it will not call in the aid of force again, and set the police pack upon you to hound you out of your hovels? The case also used a map to demonstrate the global spread of rent striking from Argentina to USA to Soweto. If you have any comments to add, please make them in our contact section. The Anarchist Peril by Felix Dubois includes cartoons from the period by Pere Pienard which we also included from our T/SoR 3 Cooper collection. Clearances from crofts for profitable sheep farming created disputes across Scotland. Newspaper accounts of the time demonstrate the role of women in this 1882 Rent Strike on Skye where the crofter males were frequently at sea leaving the women and children largely to push the land issues. This dispute over withdrawal of pasture grazing rights led to crofters’ non-payment of rent. The Exhibit deconstructed this Strike into basic elements: women, children, solidarity, petition, deforcement of warrant, blockades, siege, disproportionate force used as intervention against the majority, direct actions drawing parallels with the later Glasgow 1915 strikes. The Petition showed their earliest tenant challenge to Lord MacDonald, signed by over 45 tenants (scribed in the same hand). He escalated this communication into legal Eviction Notices. Delivery of these warrants to the named crofters in April resulted in direct action against the Sheriff officer. News accounts reported ‘Young lads with flags’ became the lookouts running ahead to rally the demonstrators who lined the path intimidating the Sheriff. Deep blockades surrounded the house so that the warrant could not be delivered. A newspaper account of the later trial describes the angry demonstrators’ use of humiliation to force the Sheriff to burn the warrant amid the shouts and mud throwing. The deforcement of the Warrant by the families resulted in local police seeking reinforcements to re-deliver it sending 50 police, local and from the mainland accompanied by journalists and a gunboat moored offshore. This disproportionate force and dawn raid strategy further escalates the violence of the stand off to a pitched battle of Police against sticks and stones of the crofters. Stones were carried in their aprons and accounts show that 7 of the 10 injured were women. 5 men were arrested and gaoled in Inverness. The media covered the story sympathetically in the bigger cities and solidarity groups became established across the country. A poster advertising a public meeting tries to raise awareness in Glasgow, Gorbals of the issues. The publicity creating public sentiment, remembered in songs and poems and helped the crofters to win land rights securing their own and other crofting tenures through Parliament by 1886. John Maclean organised an association around rent issues in 1913 and ILP Housing Cttee with Womens Labour League formed the Glasgow Womens’ Housing association. This was galvanised by the Women’s Housing Association which included Helen Crawfurd and Mary Barbour and Rent Restriction Committee window poster campaign. Melling describes how the design of the tenement close itself assisted the strikers. Built around common back courts with shared washhouses and neighbour networks, the tenants adopted forced collectivity viewing individual Arrears of Rent Ejectment Notices as common threat reacting in solidarity, marching on their behalf enmass to the courts. As well as housing 6-8 families simply blockading the single front and rear exit creating fortification which made it difficult to serve the warrant itself. Roles were orchestrated with each close having a secretary, street picket lookouts , raising alarms with bells, blockading front and rear entrances with prams, children or demonstrators, noise, verbal and physical intimidation, flour throwing, deforcement of the warrant. Visible solidarity through 20,000+ window poster campaigns reduced the sense of isolation which could weaken the non-payers. Tom Bell [Bell 1941; 110] describes the intense industrial agitation from 1910 and how the Singers and Argyll Motor Works Strike Clydebank laid the foundation for over-ruling union leaders who were opposed to mass action, excluded the new machinists in their ‘craft’ memberships and were forever seeking the way of compromise, acting as ‘lightening conductors and running the mass discontent into the ground’. The British Government was concerned about disruption to wartime production and radical threats might slow it down. David Kirkwood in his autobiography describes being shop steward of Parkhead Munition Workers who threatened a ‘most vigorous and extreme reply, and one which might have most disastrous consequences’ if a family was evicted – regarding this as an attack on the working class’, which they duly enacted. Crowds of 20,000 demonstrating outside the court hearings were addressed by John Maclean. That same day 17th November 1915 he received his letter of dismissal from Govan Parish School Board, dismissed following charges under the Defence of the Realm Act 1915 (DORA) and charged with uttering statements calculated to prejudice recruiting for War. The No Conscription Fellowship founded in 1914 was a loose network of militant pacifists and radicals who supported those who resisted conscription. Clifford Allen its chair, was imprisoned as a conscientious objector and as a result of the harsh treatment he received in jail he contracted tuberculosis from which he never recovered. More than 300 soldiers in the British Army were shot by court martial during WW1 most of them for desertion. Private Harry MacDonald, (shot at dawn) pictured in the display had 3 small children. The Granite Echo, published by Guy Aldred contained the smuggled out writing of the Conscientious Objectors in the Dyce prison near Aberdeen. Councillor John Wheatley and others wrote against conscription in The Worker– Organ of the Clyde Workers Committee whose offices were raided and closed briefly by Glasgow Police. War’s Toll was quantified by the IWW in their Solidarity newspaper in the USA citing the differing stands that the I.W.W. and the A.F.L. took during World War I. It was originally used in the trial of the United States vs. William D. Haywood, et al. Between 1917 and 1919 a series of mutinies took place amongst the world’s most disciplined armies. The Russian, German, Italian and French forces as well as the British all ‘suffered’ major outbreaks. The decision to mutiny is not taken lightly…. Mutinies are made by those who decide to mutiny, knowing that they themselves will bear the brunt of what happens. Youth Workshops on ‘Understanding Solidarity of the Rent Strikes’ were organised by SoR volunteers with the Woodcraft Folk over several weeks full of activities creating artwork, drama, noise and exploring the strategies which helped the Rent Strikes to be so successful. Displays of their work was featured in the Exhibition. This outreach is still available if any schools would like a visit. Indispensable SoR Rota Volunteers made the exhibition event happen. 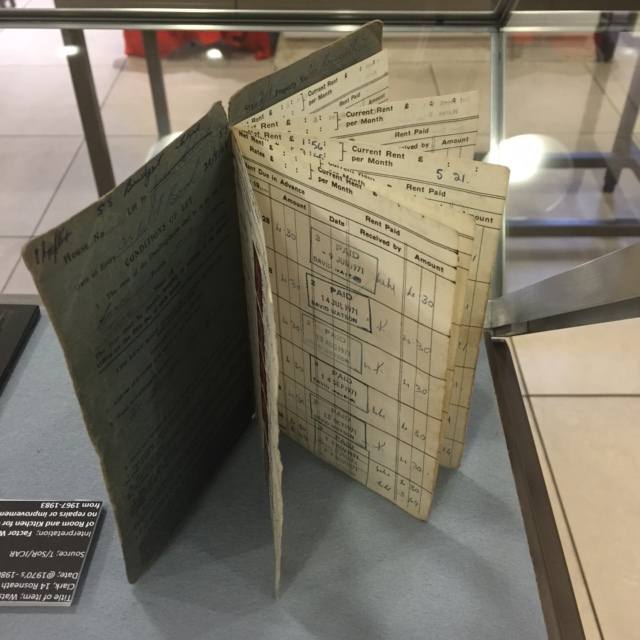 Thanks to National Library of Scotland Archives, Mitchell Archives and Special Collections, Clydeside Press, Jonathan-Clan Donald Archives, Euan S, John Cpr for material. This entry was posted in special collections. Bookmark the permalink. Both comments and trackbacks are currently closed.